A recent study revealed that 90% of excessive drinkers are not alcohol dependent. This is good news for heavy drinkers. If they decide they want to give up alcohol for a while, they won’t have to suffer withdrawal symptoms. Is taking a break from alcohol going to benefit your health enough to make a difference? Even if you only drink in moderation, drinking does have an effect on your body. 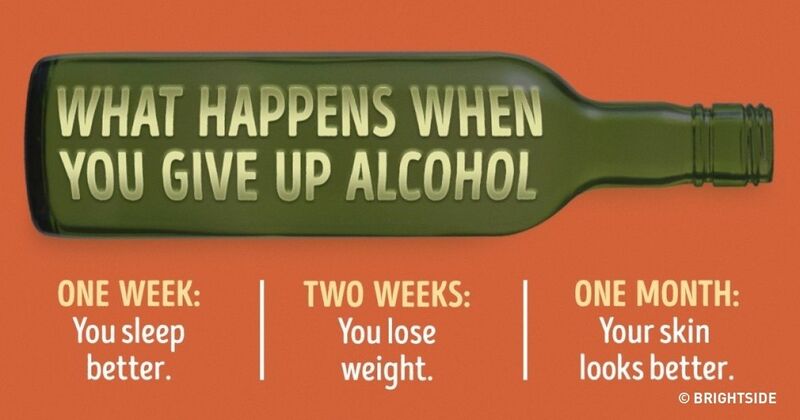 Let’s look at what happens to your body when you stop drinking. If you feel that you have a problem with alcohol, there are many resources available and often, just a phone call away. You can also look online for help and advice on how to stop drinking. When you decide to give up drinking, your body will go through a few changes and you will soon start to feel better, look better, and you’ll have more energy. Because alcohol is a diuretic, it dries out your skin and causes inflammation. Your skin will lose its ashy appearance and the color will start coming back. If you suffer from eczema, rosacea or dandruff, you could see an improvement in those skin conditions, as well. Many people may be fooled into thinking that alcohol helps them to sleep better. You might fall asleep faster but the quality of sleep throughout the night will leave you tired the next day. What happens to your body when you quit drinking is that you may have a little trouble falling asleep when you first go to bed. But you will wake up more refreshed the next day because you’ll experience deeper, REM sleep. Even more, than leaving you unfocused and tired the next day, alcohol can cause subtle changes in your brain over time. These changes in the brain can disrupt problem-solving skills, cause memory loss and decrease attention span. The good news is if you stop drinking, it’s possible that your brain can correct itself to reverse these changes. Your liver can only handle about a half ounce of pure alcohol. The rest of it flows to your heart causing weaker contractions as the heart beats. This causes your heart to pump less blood. Simply put, drink alcohol and blood pressure drops. Over time, this can cause serious damage and lead to heart disease. Stop drinking and let your heart start healing. There are a lot of calories in alcohol. Very often, you won’t realize how many drinks you’ve had. If you cut back on drinking, you will significantly reduce your calories. The weight will come off without even trying. This could also be a great time to start a daily exercise routine. You can focus on working out to keep your mind off alcohol. What happens to your body when you stop drinking is important if you are ready to get back to a healthier you. If you want to stop for a month to give your body a break or if you want to quit forever, there’s no better time than right now to get started. For other tips on how to take back your health, check out more great articles here.